Most common swimming pool hose to 3/4" male garden hose. 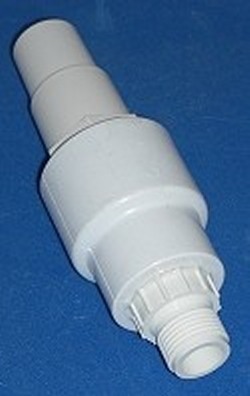 Swimming pool hose end is tapered and stepped to fit 90% of the most common pool hoses around. Note: since this is a tapered fit, the amount of pressure it'll hold will be low, but should be enough to hold most pool pumps. It'll depend on the back pressure from the garden hose end.